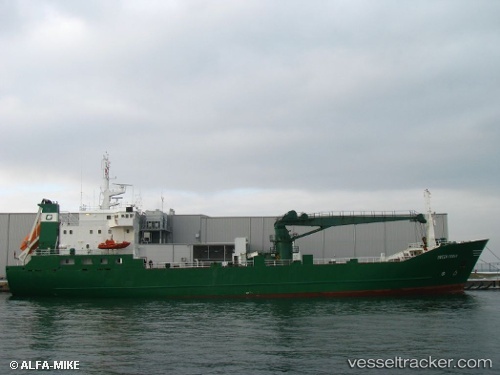 The Royal Arctic Line has chartered the "Green Frost" as a replacement for the Danish cargo m/v Angaju Ittuk", 381 gt (IMO: 8208737), which was in collision with an iceberg on July 11, 2016, off Nanortalik and was expected to need a longer dry docking because of the heavy damage at the bow enforcing a redeployment of distribution between the South Greenland feeding ports and settlements. The powerful impact had breached the ship above the waterline and caused dents at starboard side, howerer, it did not suffer serious damage below the waterline. Neither crew nor cargo on board were damaged in the accident. The company Royal Arctic Line was cooperating with the relevant authorities to clarify the cause, context and follow up of the accident. The ship remained berthed in Nanortalik for inspections for the time being. The "Green Frost" will ply the Upernavik area with associated settlements, but as the ship can not dock in all villages in the district, they have to expect delays. On July 18 the "Green Frost" was still docked at the Aalborg Container Terminal.